Studies show people underestimate the difficulties faced by others. 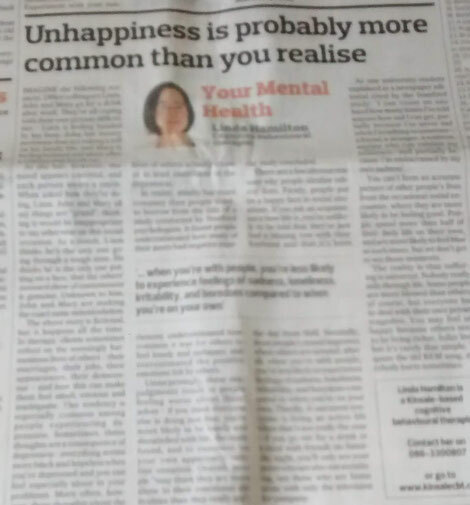 In last week's Your Mental Health column in The Southern Star, I explored how people tend to underestimate how common it is for others to feel lonely and unhappy. In truth, everybody hurts sometimes. The column is reproduced below. Imagine the following scenario. Office colleagues Liam, John and Mary go for a drink after work. They’re all coping with their own private difficulties – Liam is feeling hassled by his boss, John has money problems that are taking a toll on his family life, and Mary is feeling isolated and alone after a relationship break-up. At the bar, however, the mood appears convivial, and each person wears a smile. When asked how they’re doing, Liam, John and Mary all say things are “grand”, thinking it would be inappropriate to say otherwise on this social occasion. As a result, Liam thinks he’s the only one going through a tough time. He thinks he is the only one putting on a face, that the others’ outward show of contentment is genuine. Unknown to him, John and Mary are making the exact same miscalculation (continued below). The above story is fictional, but it happens all the time. In therapy, clients often reflect on the seemingly harmonious lives of others – their marriages, their jobs, their appearances, their demeanour – and how this makes them feel small, envious and insignificant. This tendency is especially common among people experiencing depression. Sometimes, these thoughts are a consequence of depression – everything seems more black and hopeless when you’re depressed and you can feel especially alone in your problems. More often, however, these thoughts about the lives of others actually cause or at least contribute to the depression. In reality, misery has more company than people think, to borrow from the title of a Stanford study. It found people underestimated how many of their peers had negative experiences; underestimated how common it was for others to feel lonely and unhappy; and overestimated the positive emotions felt by others. Unsurprisingly, these misjudgements result in people feeling worse about themselves – if you think everyone else is doing just fine, you’re more likely to be lonely and dissatisfied with life, the study found, and to ruminate on your own apparently inferior situation. Overall, people “may think they are more alone in their emotional difficulties than they really are”, the study concluded. There are a few obvious reasons why people idealise others’ lives. Firstly, people put on a happy face in social situations. If you ask an acquaintance how life is, you’re unlikely to be told that they’ve just had a blazing row with their husband and that it’s been the day from Hell. Secondly, most people’s mood improves when others are around; after all, when you’re with people, you’re less likely to experience feelings of sadness, loneliness, irritability, and boredom compared to when you’re on your own. Thirdly, it can seem everyone is living an active life when that’s not really the case – if you go out for a drink or a meal with friends on Saturday night, you’ll only see your peers who are also out socialising, not those who are home alone with only the television for company. As one university student explained in a newspaper editorial cited by the Stanford study: ‘I can count on one hand how many times I’ve told anyone how sad I can get, partially because I’m never sad when I’m talking to someone—a friend, a stranger, a waitress, anyone who can validate my existence—and partially because I’m embarrassed by my own sadness’. You can’t form an accurate picture of other people’s lives from the occasional social encounter, where they are more likely to be feeling good. People spend more than half of their daily life on their own, and are more likely to feel blue at such times, but we don’t get to see those moments. The reality is that suffering is universal. Nobody really sails through life. Some people are more blessed than others, of course, but everyone has to deal with their own private tragedies. You may feel unhappy because others seem to be living richer, fuller lives, but it’s rarely that simple. To quote the old REM song, everybody hurts sometimes.